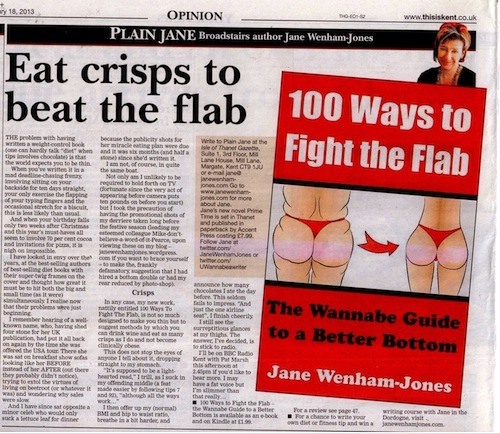 One hundred helpful and hilarious tips for fighting the flab and looking your best from Jane Wenham-Jones, best-selling author and columnist. As featured on the thisiskent.co.uk website. Update 18th January 2013: 100 Ways received its first review! To celebrate the launch of Jane’s new eBook, 100 Ways to Fight the Flab – The Wannabe Guide to a Better Bottom, Jane and Chez Castillon offered the chance to win a week-long writing course at the fantastic Southern France location in the Dordogne. The Competition was won by Clare Macintosh. Congratulations to her and those shortlisted.